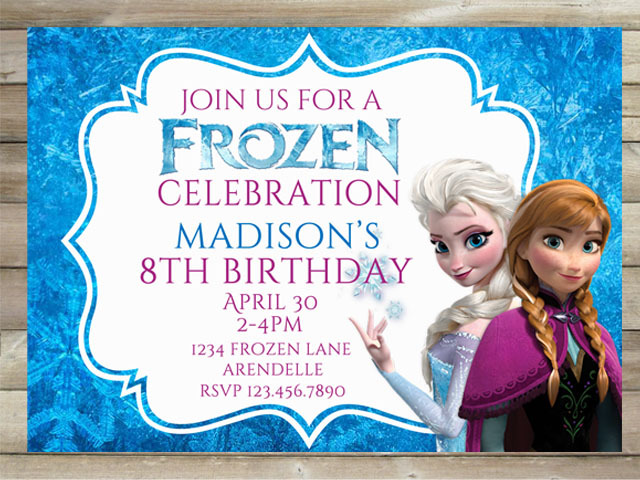 I am so excited to finally get to share my daughter’s Frozen Party with you! 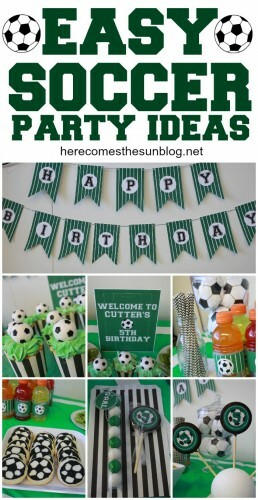 I had so much fun putting this party together. I think because everything was glittery and sparkly which is right up my alley. 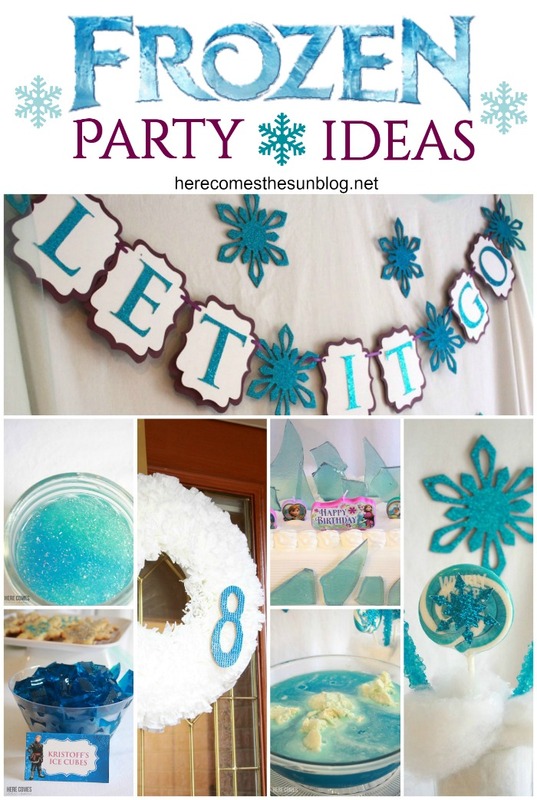 This post is chock full of Frozen Party Ideas so you can easily throw your own! First, every party needs to start with an invitation. This is the invitation that I created and it is available in my shop, along with numerous other invitation designs. I hung a coffee filter wreath on my front door to welcome guests to the party. Since my daughter was turning 8, I used a wooden “8” and hot glued blue gems to it. 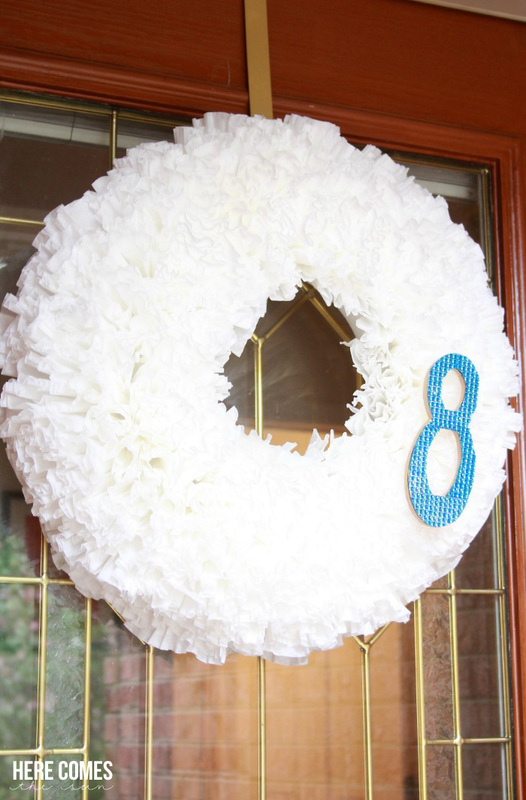 Then I hot glued the “8” to the wreath. When the party was over, I was able to remove the “8” easily by snipping a bit of the coffee filters off. Now I have a basic white coffee filter wreath that can be used for any season. The next activity that we had was a snowball toss. To make this game, I simply used my Silhouette machine to cut out the circles and numbers and taped them onto the front of the buckets. Fortunately we had purple and blue buckets on hand in our garage. If you don’t have purple and blue, no worries. 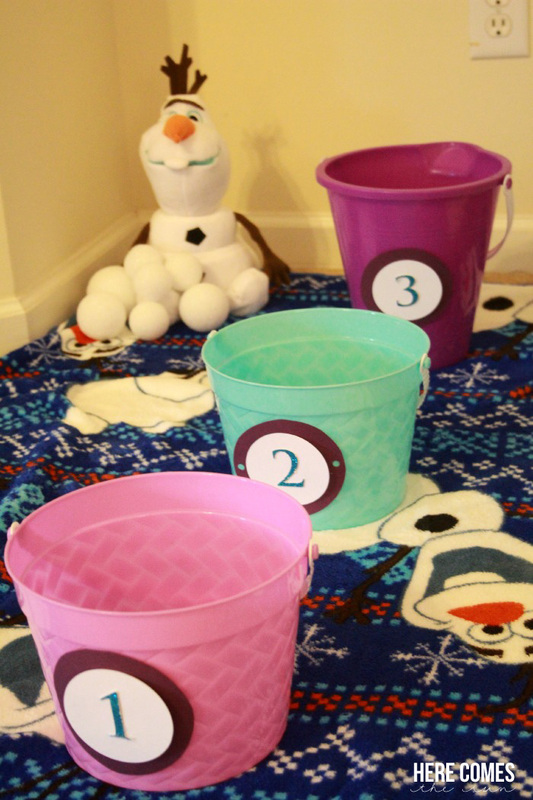 Just use what you have, If you are throwing this party in the summer, you’ll be able to find tons of beach buckets at the dollar store. Not so much in November though. For the snowballs I used various sizes of styrofoam balls. 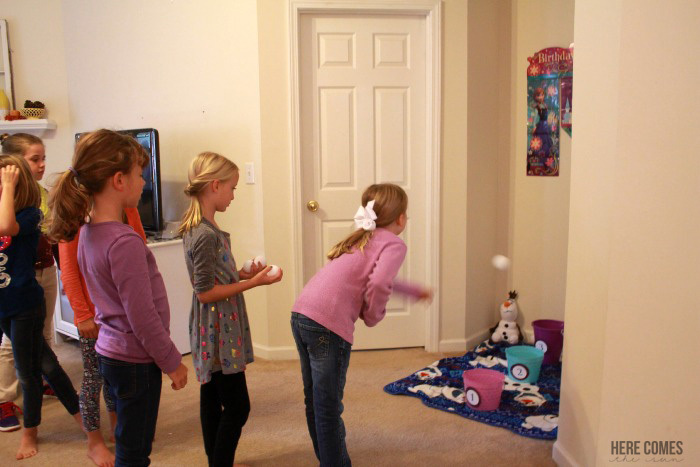 The girls took turns tossing the snowballs into the buckets and keeping track of their scores. 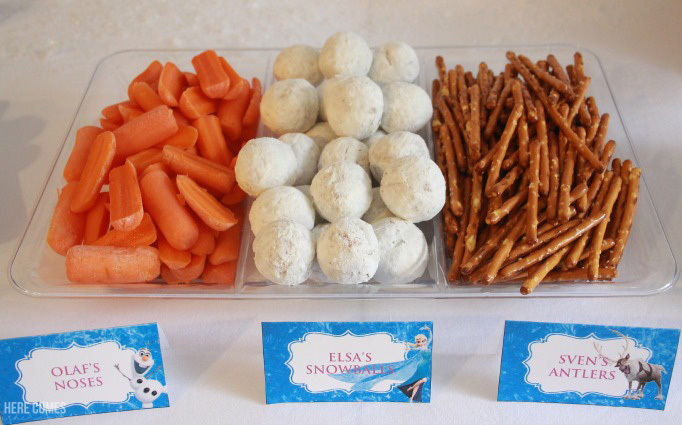 My favorite part of every party is the food table. 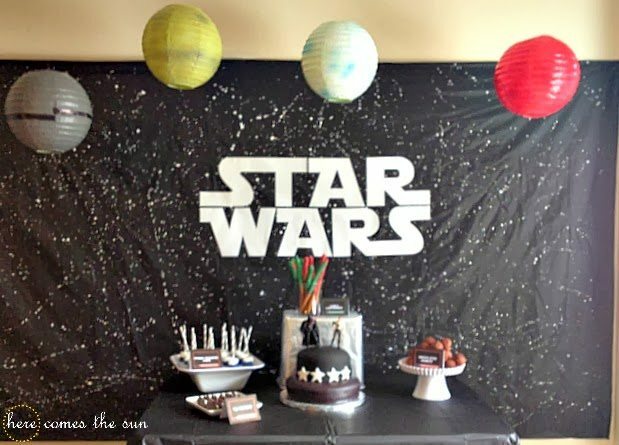 I love decorating it and coming up with food ideas to match the party theme. 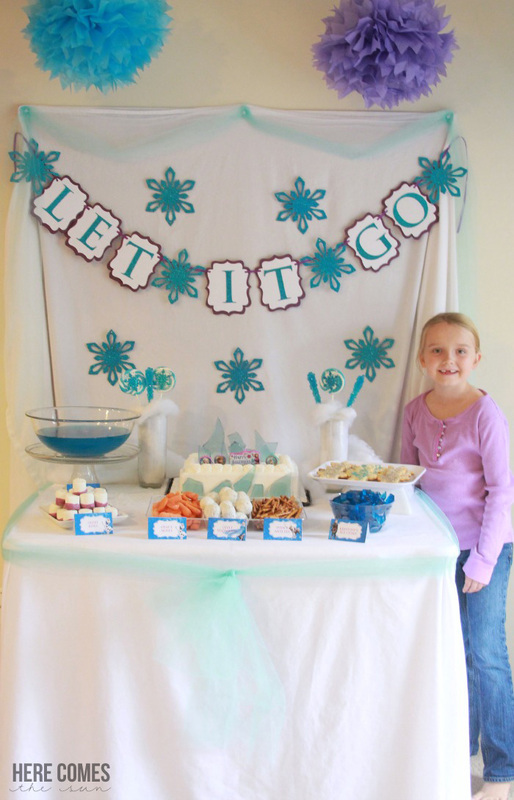 I created a backdrop by hanging a white sheet and then draping some blue tulle around the edges. To make the banner, I used my Silhouette machine to cut out the letters and shapes. How awesome is that blue glittery cardstock! I attached each layer together with hot glue and then punched holes in the upper left and right corners and threaded ribbon through the banner. I picked up the big blue snowflakes at the craft store. They were $1.oo for 3 so I grabbed a lot of them. I used them for spacers in the banner and I also taped them to my white backdrop. 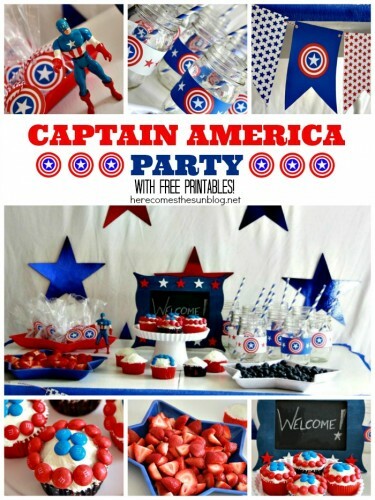 I did something similar with stars on the backdrop for my Captain America party a while back and I just loved the look and it is so easy. 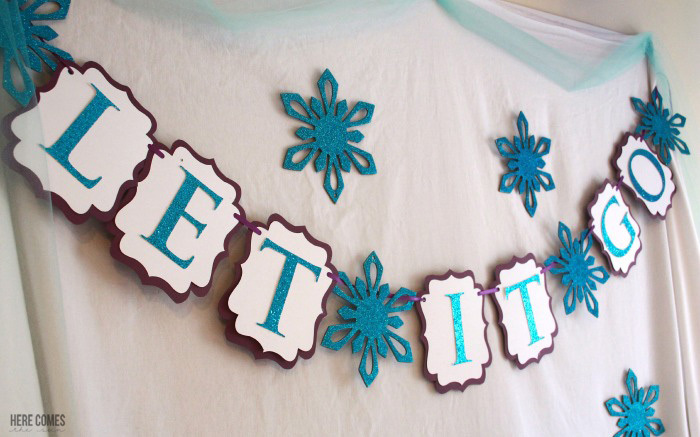 I just used regular masking tape to hold the snowflakes onto the backdrop and it worked really well. I also hung blue and purple tissue paper balls from the ceiling. My daughter loves to get pictures of herself with all the food tables that I make. I used a white twin sheet as a tablecloth. I like to use sheets instead of plastic table covers because you can iron sheets and make them all nice and smooth. Whenever I use a plastic tablecloth, there are creases in it that I just can’t stand. 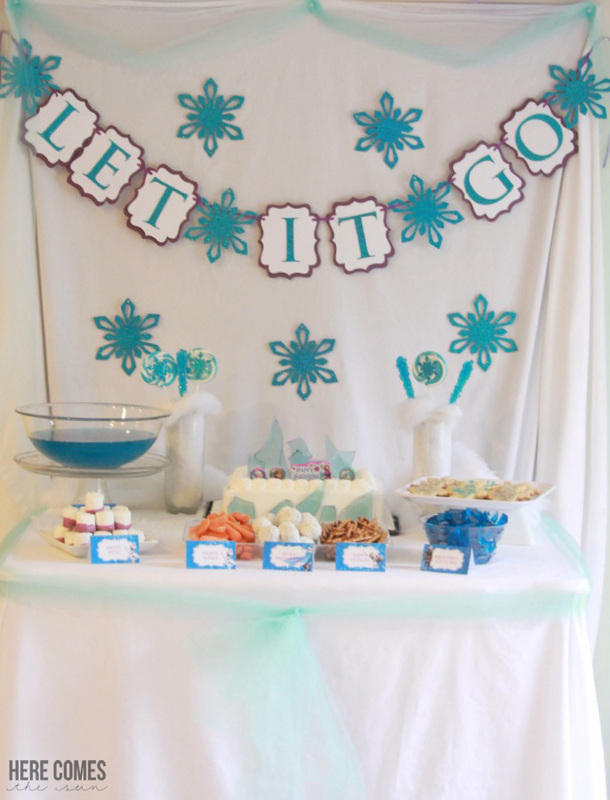 I added some fake snow and also put some blue and white Whirly Pops and blue rock candy into glass jars for decoration. 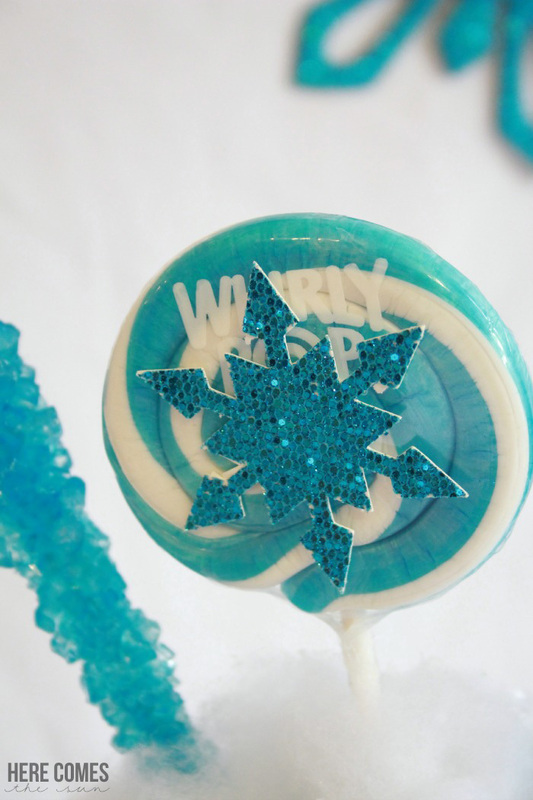 I dressed up the Whirly Pops by cutting out snowflakes from the same glitter cardstock that I used for the banner. I tied more blue tulle around the edge of the table to finish the look. This setup was so cheap. All I had to buy was the tulle, cardstock, snowflakes and the snow. It probably cost me a little more than $10 total. Now for the food. 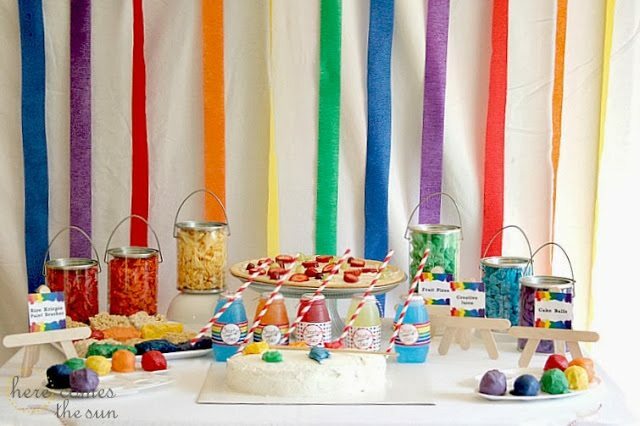 I kept it simple with just snacks, punch and cake. 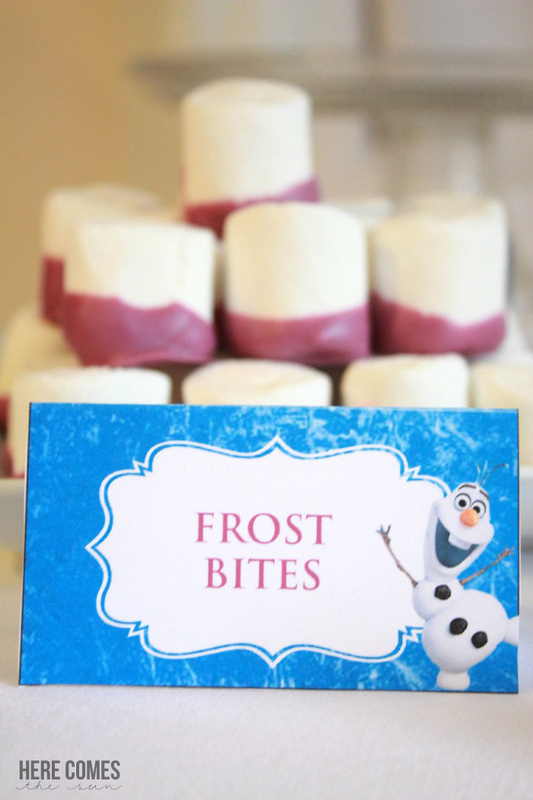 I had carrots (Olaf’s Nose), donut holes (Elsa’s snowballs), pretzels (Sven’s antlers), jello cubes (Kristoff’s ice cubes), and dipped marshmallows (Frost Bites). 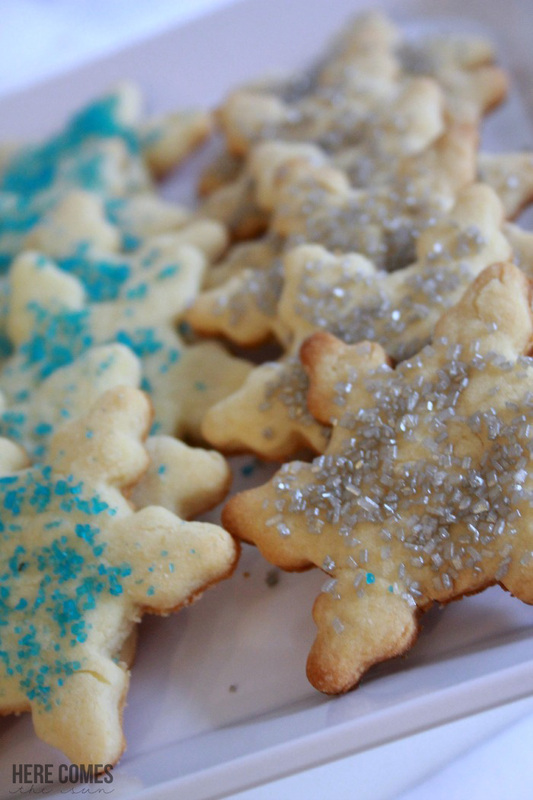 I also made simple sugar cookies using a snowflake cookie cutter (yay for having a birthday during the “Christmas” season when all the holiday items are in the stores!). 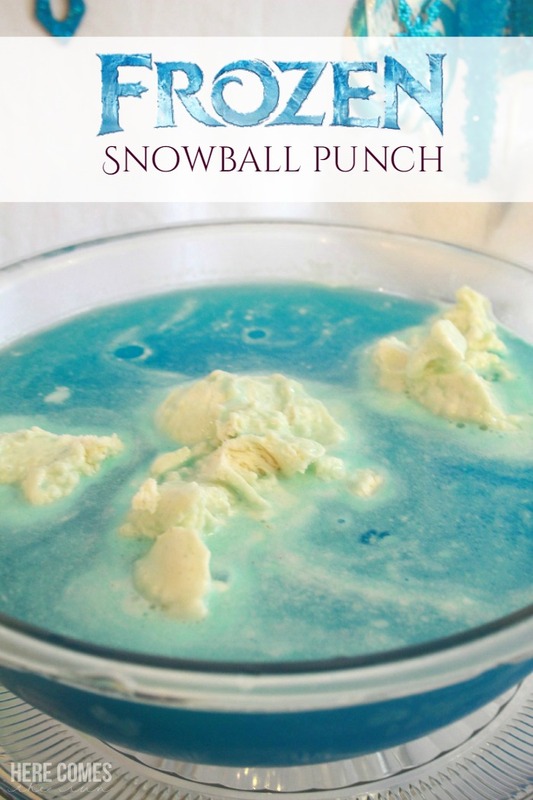 I made Snowball Punch by adding equal parts of Hawaiian Punch and 7 Up to a punch bowl and then adding scoops of vanilla ice cream right before serving. Every year I stress about the cake. I like to go all out on the cake and let me just tell you that I was not born to decorate cakes. I have these grand plans and then they end up looking less than spectacular. So when my daughter said she wanted an ice cream cake, I was very relieved that I would not be slaving in the kitchen night after night. I bought a simple ice cream cake from the grocery store and added blue “ice” and candles to it. 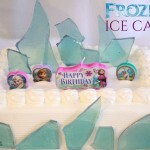 The ice is very easy to make. I’ve included the recipe below. In a medium saucepan, stir together the white sugar, corn syrup, and water. Cook, stirring, over medium heat until sugar dissolves, then bring to a boil. Without stirring, heat to 300 to 310 degrees F (149 to 154 degrees C), or until a small amount of syrup dropped into cold water forms hard, brittle threads. Remove from heat and stir in food colorin. Pour onto a silpat lined baking sheet/ jellyroll pan. 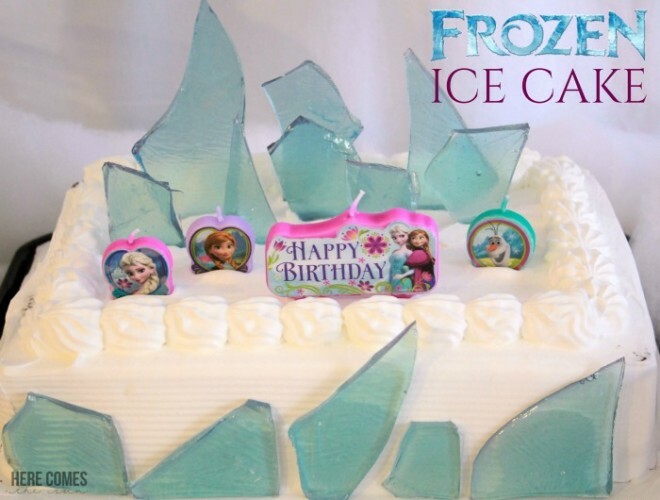 Let cool, and break into large pieces that resemble broken ice. Store in an airtight container. 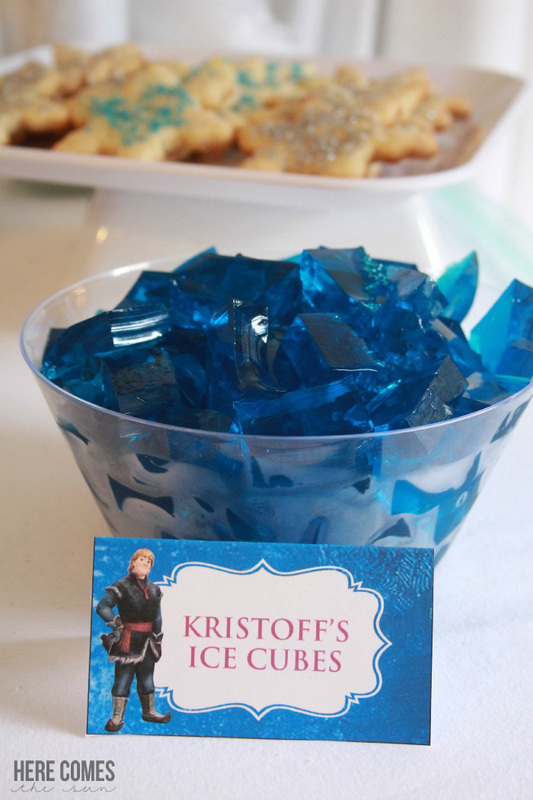 For the goody bags, each girl got a sparkly gumball tube filled with blue and white gumballs, a crown feather pen and a jar of Frozen Glitter Slime. 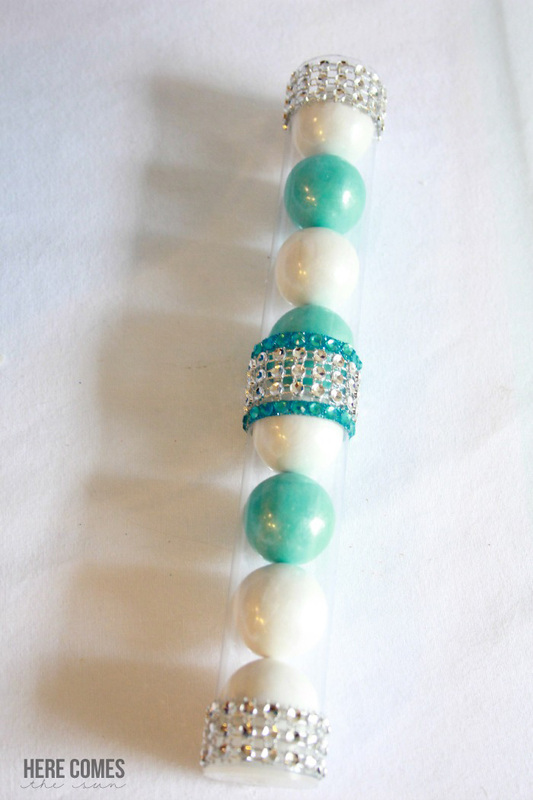 I added a little bling to some plain gumball tubes with blue and white gems. They also got to take home the Whirly Pops and the rock candy. 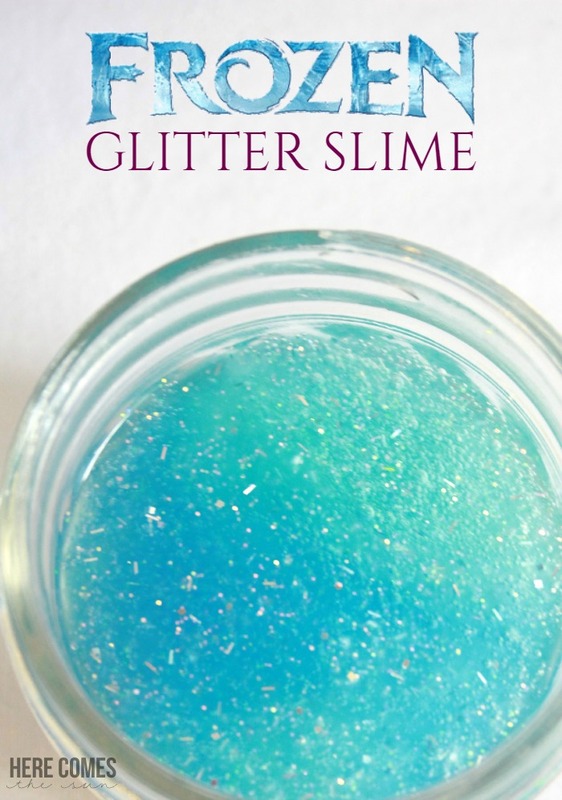 I will be adding a tutorial soon for how to make the slime. 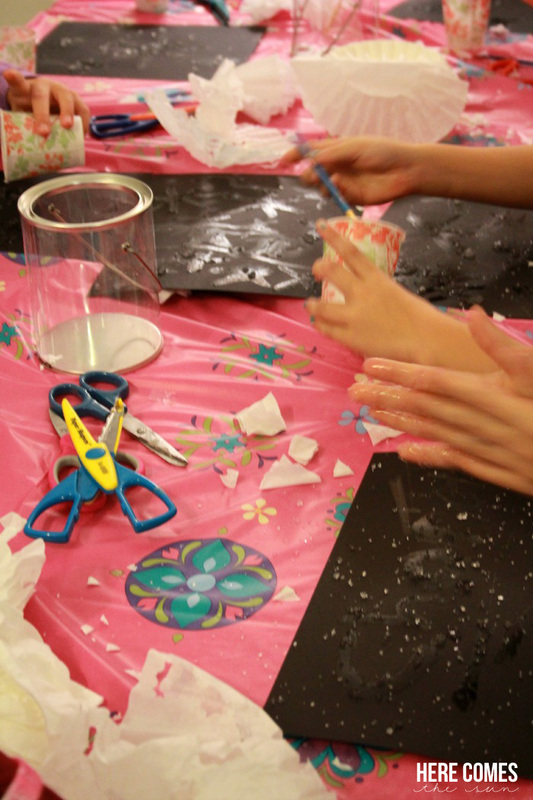 I had so much fun planning this party and my daughter and her friends had such a great day! Birthday Express provided me with supplies for this party. All opinions are 100% my own. This post contains affiliate links. Buy purchasing products through these links, you help to support this blog.